Here's the doily that I made for my Mom for Mother's Day. 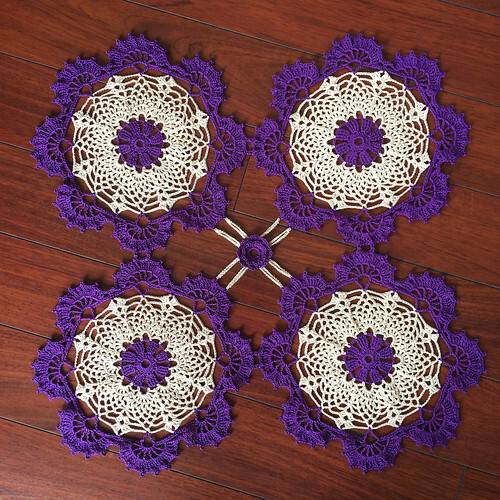 The pattern is #26 from Motif Lace Doilies by Nihon Vogue, a lovely Japanese crochet book. (Ravelry page here.) Great pattern, which I thought could look nice with two colors to really make the little 3D flower in the center pop! It's a great pattern and a fun make. I used size 10 crochet thread and a 1.65mm hook. I forgot to measure it, but it now has four pots of violets on it! I'm hoping it has a lot of good violet growing juju in it!! 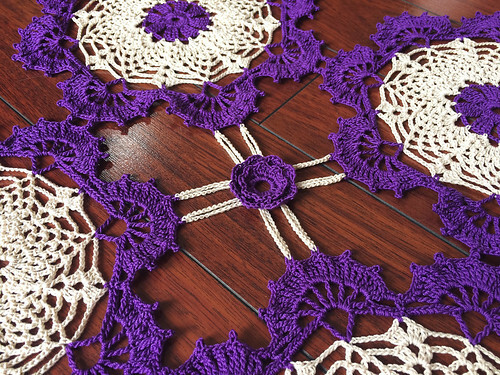 What an amazing doily you made for your mother for Mother's Day. She must have been totally thrilled. Beautiful work, Kate.